The historic Gold Butte Lookout is located five miles northeast of the Detroit Ranger Station on the Willamette National Forest. The Civilian Conservation Corps constructed the hip roof, L-4 ground structure with catwalk in 1934. 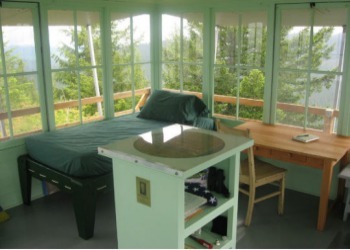 Eight years later the Forest Service constructed a cabin in the saddle north of the lookout station where it was staffed year round as part of the aircraft warning system during World War II. The lookout and cabin were abandoned in the early 1960’s and scheduled to be burned. In 1991, Gold Butte Lookout was evaluated as eligible for the National Register of Historic Places, and is listed in the National Historic Lookout Register. 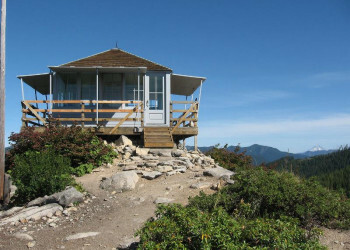 In the final year of his life, Ron Johnson, a retired Forest Service dispatcher and then Director of the Oregon Chapter of the Forest Fire Lookout Association (FFLA), recommended that District officials contact the Sand Mountain Society to form a partnership to restore the fire lookout. The Sand Mountain Society is a volunteer group responsible for restoring a number of historic lookouts across Oregon and Washington. The Forest Service and Sand Mountain Society (SMS) entered into an agreement to rehabilitate and maintain Gold Butte Lookout. When work began in 1999, SMS volunteers found a massive infestation of carpenter ants and dry rot that had so compromised the structural integrity of the lookout that it had to be taken down to ground level and re-framed. Many visible components including windows, floor, wall, and ceiling boards were re-usable. Each element was carried off the mountain, stripped of paint, and replaced in its original location. SMS volunteers have worked diligently with the Forest Service to restore the lookout according to the Secretary of Interior’s Standards for Rehabilitation and Guidelines for Rehabilitating Historic Buildings. The Sand Mountain Society has dedicated funds, materials, and thousands of hours of volunteer labor. The effort has been dedicated to Ron Johnson and all those who help preserve our heritage resources. On September 9, 2006, a celebration will take place at the lookout beginning at 1:00 pm. There will be a display at the Detroit Ranger Station where participants can pickup a map with directions to the lookout. Detroit Ranger Station is approximately one hour from Salem, Oregon. Participants should allow 45 minutes to drive to the lookout from the Detroit Ranger Station. Vehicles need high ground clearance and car pooling is encouraged as space is limited. After parking you will be shuttled to the lookout trail. The trail is about one mile long and of steep grade. Wear appropriate shoes and bring water. Allow 30 minutes for the hike. Due to limited space, participants will need to pre-register to attend. For more information or to register contact Cara Kelly at the Detroit Ranger Station, 503- 854-3366 or e-mail cmkelly@fs.fed.us. To keep quality up and the pace acceptable on the Gold Butte restoration project, volunteers worked late into each fall and endured conditions that were not always optimal. 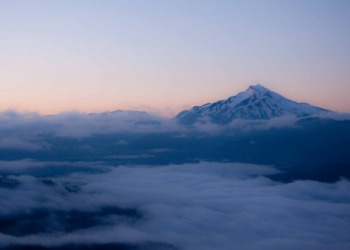 SEASON AVAILABLE: Mid-June through mid-October, depending on snow conditions. STAY LIMIT: The maximum length stay is four consecutive nights. There is a two night minimum length stay on weekends. Fees are used directly for the maintenance and preservation of the lookout. CHECK IN/OUT: Check in time is 2:00 PM. and check out time is 11:00 AM.